I caught the bus from Maizuru to Kyoto Station and then stumbled down into the bowels of the earth to catch a subway to Shijo station. It was very confusing so I just kept on asking people until I made it. 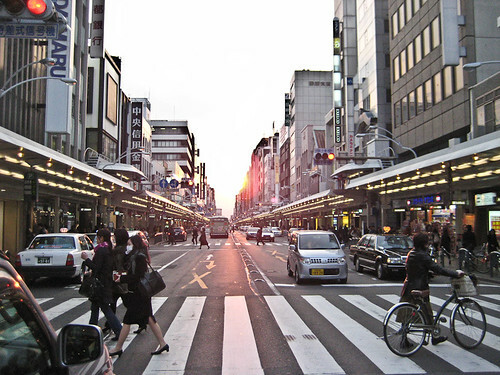 That afternoon I went for a walk along Teramachi Street. There are heaps of shops and in the olden days it was where they sold all the souvenirs and relics for the temples. I could not believe all the fashions. Everyone is all dressed up in the latest gear. And everyone has a “look”. It is like they are playing characters out of manga or anime. This is a shop where they sell gift boxes with candy and biscuits and other stuff in them. 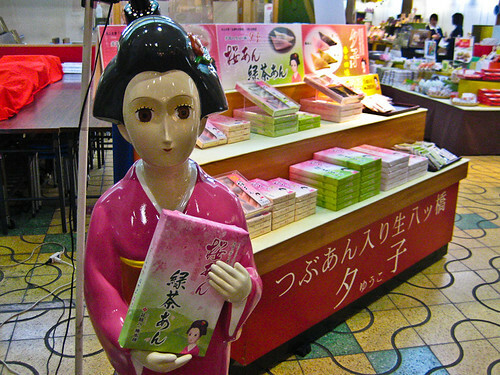 Giving gifts of food is big in Japan. There are Pachinko parlours all over the place. Pachinko is like slot machines but with round balls. The noise in these places is horrendous. I think they are horrible stupid places. Gambling is so dumb. This was an advertisement outside one of the parlours. 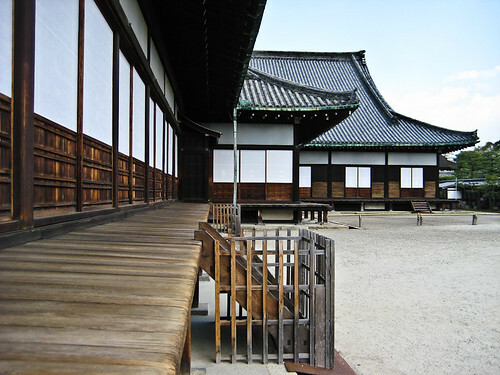 This afternoon I went for a walk to the Kyoto Castle, Nijo-jo. I could not believe how much like a samurai movie set it was like. 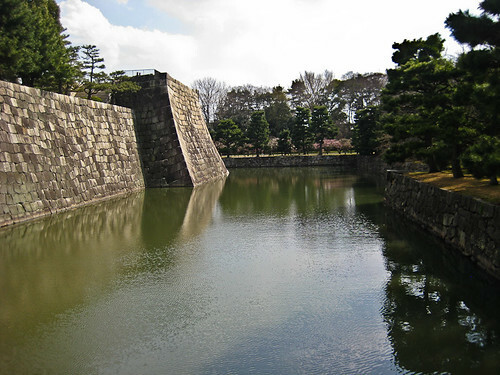 I could visualise the ninjas walking across this moat in their floating pontoon feet and then scaling the walls to assassinate the shogun. This is the castle where they have the nightingale floor. They had this floor made so it squeaked whenever someone walked on it so that they would hear the ninjas coming to kill the shogun. It really does squeak and sing like a nightingale. 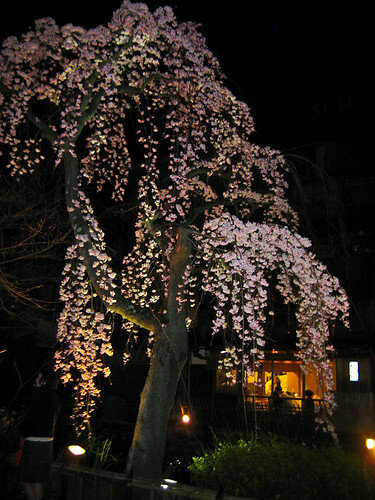 Then later on tonight I went to the Gion district and saw these Cherry trees in blossom. When the cherry trees blossom it is called Sakura in Japan. It is a pretty special time for the Japanese and they go and have picnic under the cherry blossoms and drink sake. The Gion area in Kyoto is where all the geisha hang out but I did not see any. Maybe they were busy. 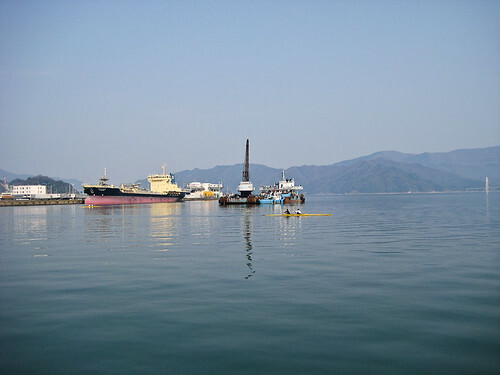 I arrived on the ferry from Otaru at 9pm and walked to the Port Shine Hotel which overlooks the port, funnily enough. The next morning I went for a walk with the video camera to find some birds. I am not too confident about my identifications because I do not have a birds of Japan book and the internet does not have a very lood photographic listing. Anyway, here is a photo of the port. It is nice and glassy early in the morning. Later on the wind came up and made it all choppy. The first birds I spotted were what I thought were Asian House Martins (Delichon dasypus). The were foraging around in the grass pecking at the sticks and seeds. I then spotted what I thought might be Eurasian Wigeons in the creek going into the bay. But on second looks I thought they might be Northern Shovelers. I have really no idea. It is a lot more difficult to identify birds from a video. After that I walked up this wooded hill and spotted a Dusky Thrush on the way back. Back down on the street along the port, I spotted some Black-eared Kites and got a few shots of some of them. They have this piercing call and you can hear this on the video. I also spotted an Osprey but failed to get a shot of it. I also filmed some Eurasian Tree Sparrows. On the creek next to my hotel I filmed some more ducks, a pair of Little Grebes and a Little Egret. 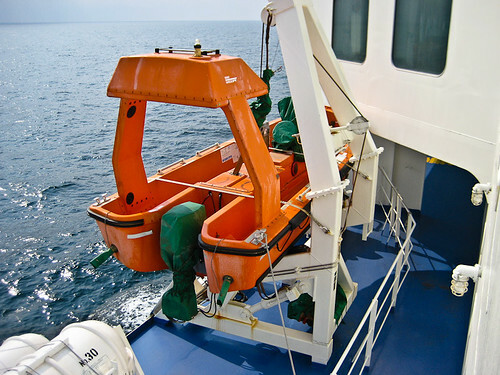 Somewhere on the Sea of Japan. 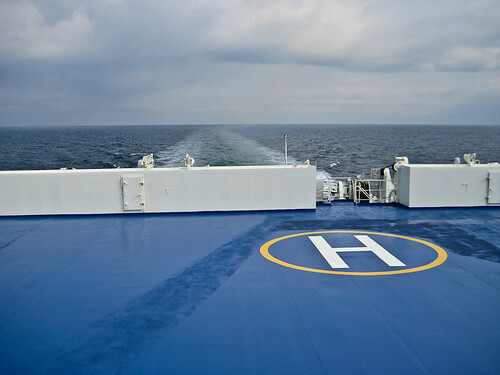 I am somewhere on the Sea of Japan about half way between Otaru and Maizuru. I cannot see any land. I am surrounded by ocean. I was hoping to see some sea birds but there is nothing. Not even any seagulls. The wind is blowing pretty strong and you are not allowed out on the decks. I do not know why because it is not that bad. There is not much to do except walk around and play video games on my mobile phone. There are a couple of movies this afternoon in the Conference Room. That should be fun. I set out yesterday from Furano at 9am and caught the bus to Sapporo. The Chuo bus goes from next to the Service Station at Kitanomine and costs 2200 Yen. All the crew from the Alpine Backpackers were there to send me off and I even got a couple of presents of candy and snacky things for my journey. I was very touched. Karin from the Chupka Coffee Shop across the street was there as well to see me off. I have met some wonderful people in Furano and I hope that I can repay their kindness in some small measure in the future. On the bus ride to Sapporo I spotted a White-tailed Eagle soaring over the Sorachi River just before Shiminoshita near the Tachiyori Bridge. There is a dam there and the lake is all frozen over with ice. I do not think I would be game to skate on it, but. There are long tunnels going through the hills. I was going to say mountains but there are no real big mountains in Hokkaido, just some hills. I also saw a heap of kites or hawks around Ashibetsu and Hiragashi. I have not had access to the internet or a book so I could not identify them yet. They were hovering and twitching their tails just like kites and kestrels do to maintain their position in the air. At Sapporo I walked around the city for a couple of hours. It is not much of a city, just a bunch of high rise buildings, but they do have some really good ski fields just out of town, so that is a major plus. I was quite intrigued by the ladies’ fashions. It seems shorts and culottes are “in” in Japan at the moment. and long black socks and also mini-skirts. I feel sorry for some of the young lasses in their mini-skirts. Their legs must be freezing. brrrr. I then jumped on the bus for Otaru and ended up at the Otaru Station Terminal after about an hour. I saw one ski field that must have been less than half a kilometer from the ocean. It was quite bizarre. You can see a number of ski fields in the hills surrounding Otaru. I think there are about 3 resorts, and Kiroro, which is about 50 minutes away. I had to wait hours at the Ferry Terminal for the boat to leave. It finally left at 11:30 at night. I was in a Second Class berth. I got a bed. 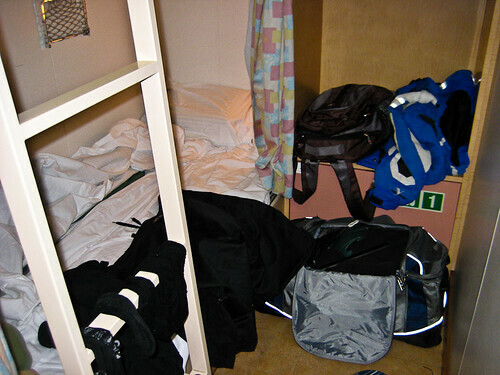 The cheaper berths do not have a bed, you just sleep on the floor. Yikes! It is now 11:30am and I am going to have some instant noodles for lunch and then watch the movie. 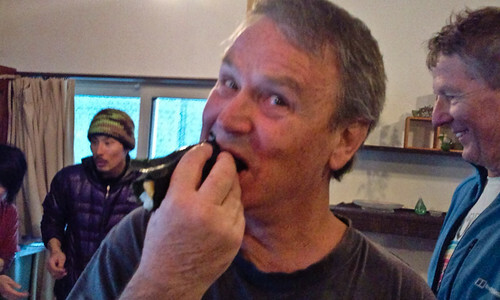 Today I was invited by the boss of the hostel where I am staying, Alpine Backpackers, to go with them on a staff day out to Asahidake for some powder skiing. We set off about 8am and arrived at Asahidake Ropeway a bit before 10am. So I am guessing that it takes about an hour and a half to get to Asahidake from Furano. The cable car or Ropeway as they are called in Japan, leaves every twenty minutes. I paid 2800 Yen for a four hour ticket. I reckon that is pretty good value. When we got up the top you could smell the sulphur in the air and up the mountain you could see steam pouring out of these vents in the mountain. I do not know how active the volcano is, but I was glad that it was letting off steam both literally and metaphorically. We went off down Skier’s left and it was wide open. Just a big expanse of fresh snow. It was a little bit heavy but it was still good to ski in and I was getting some pretty good turns in. I was just happy to be able to be able to ski this sort of fresh snow and not fall over every five minutes. The crew from the Alpine were having a ball and I was enjoying myself as well. We had a lot of laughs and had a lot of fun. When we got further down, it started to flatten out a bit so we just skied down the cat tracks that led back to the bottom of the ropeway. There were quite a few back country skiers taking off up the hill further and traversing to some higher ground so that they could get some better and steeper lines. 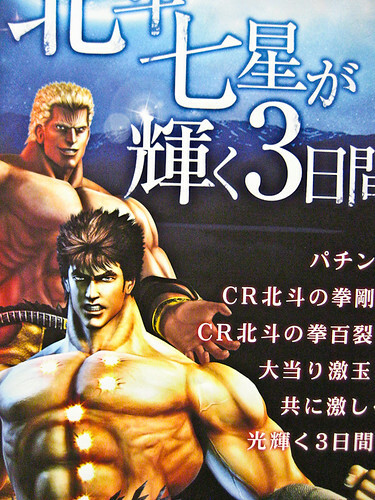 There was this wanted poster in the smoking room at the bottom of the ropeway. I was fascinated by it. 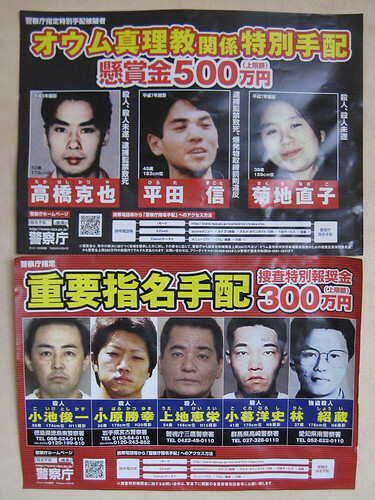 I am not sure of the full story but I think it is some kind of criminal activity and they were offering rewards of five and three million Yen for these fugitives from justice. 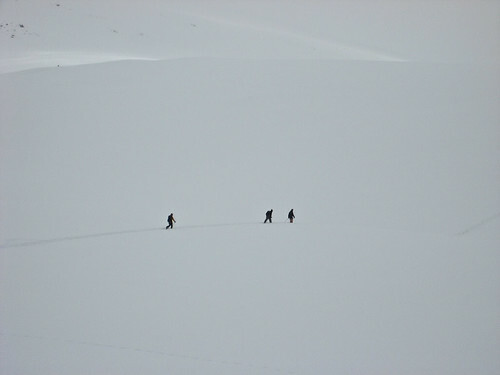 There was still heaps of back country further out that could be skied by some extreme doods. There were mountains everywhere just covered in snow. We skied from 10am until 2pm and then called it a day as we only had the four hour passes. On the trip back I saw two white foxes. I was stoked. One of them was out in the fields and he was really white. The other one was nearly a reddish colour and was in a backyard in the town of Biei. I also want to see a bear. They say there is one living in the ski resort at Furano. I hope he wakes up soon. I liked these reflections in Hiro’s goggles. We are like the paparazzi pestering him. I finally edited the video. Most of the footage was shot by Hiro. Today has been a memorable day. This morning we went for a ski and it was snowing most of the morning. I went for a run through the trees to see what it was like but it was frozen underneath the fresh snow. 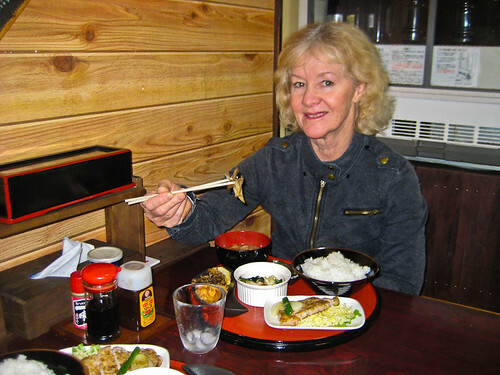 Around midday I came in and got ready to go to lunch at Sengoku Restaurant in Furano. We had to walk about two kilometers so we set out early. The restaurant is on the same street as the Railway Station. We went in and Hiro and Emi welcomed us profusely and led us into a table where we sat on the floor. After a short wait we got our lunch on a platter. 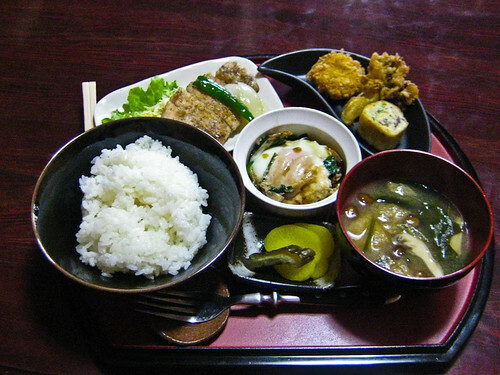 It had everything on it – rice, miso soup, pepper pork, tempura fish, daikon and a few other bits and pieces that I did not know what they were. It was absolutely delicious and out of this world. It is really difficult to describe the exquisite taste of the dishes that we were served. They were so light and delicate. I was in bliss just tasting all the various flavours. I went with Boris and Judy and here is Judy enjoying her meal. 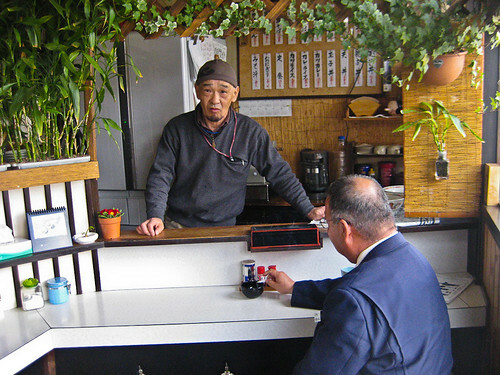 They do a lot of business taking boxed lunches, called bentos, to the businesses and workers around the shop. Hiro is the delivery man and here he is taking care of a customer. After we finished our delicious lunch we all gathered around for a group photograph to remember the day. And that was not to be the end of the day. On our way home, we ran into Kazuki and his wife, who were taking their daughter to her school graduation ceremony and he invited us out that night. Later on, we got a surprise to find ourselves at Hiro and Emi’s house and Emi had put on a grand feast for us. There was rice and Mitaki mushrooms and Sashimi and finally a delicious home-cooked Sukiyaki. And to top it off , we had some plum wine , Ushemu, which is actually a liquer. Another delicious surprise. I was replete. What a top day! Thank you Hiro, Emi, Kazuki, Chika and Karin for a wonderful time. Last night there was a benefit for the New Zealand earthquake at the hostel where I am staying. Ironically it was the day or so after the tsunami that devastated the North-east coast of Japan. On the day of the tsunami, I was having a bit of a lie down and felt this shaking and could not work out what it was. So after a while I got up and went downstairs to ask people what was going on. They were all gathered around the TV and the news was about an earthquake off the coast of Sendai. Ten minutes later we were watching live footage of the tsunami engulfing towns and countryside. The scenes were horrific and I think everyone has seen all the images by now. 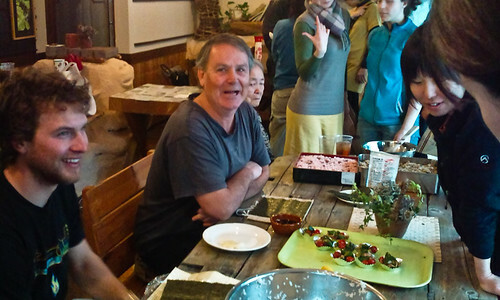 So last night there was a bit of a jumble sale, and then we got to learn how to make Sushi rolls. We put down the seaweed sheets (Nori) on a bamboo mat and then put rice down on the nori, bits of cucumber, avocado, tuna, daikin and other bits and pieces that I had no idea what they were. I did not put any wasabi on mine because it is way too hot for me. Hmm, well it is not actually hot, it just burns your nose. I also made some pink savoury rice balls that were put into a little tofu pocket, then cut in half and more weird stuff sprinkled on the top. I forget the name of them. After that, the ladies learnt how to make bath bombs and then everyone joined in some Maori games that were played with something like drum sticks. Then we had the raffle, or it was more like a lucky door prize. I won a Samurai Japan stick pin and a little wooden carving from the local massage lady. It was heaps fun. 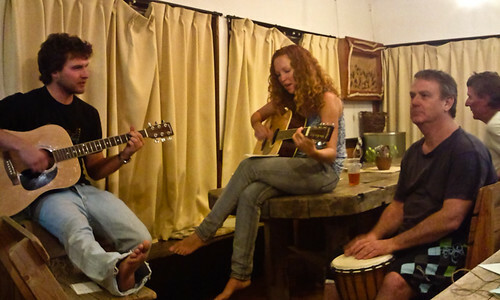 Then the crew got the musical instruments out – a couple of guitars, a keyboard and a japanese drum like a small conga. We did a few songs, and I played the drum for a while. Later on it turned into a jam session and we played for hours. I had a ball. Thanks to Nakagawa-san for taking the photos on his camera phone. Arigato gozaimasu. Accommodation: Hotels along Shinmachi street near train station. 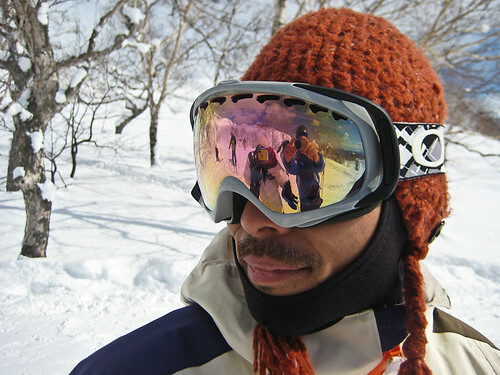 Moya Kogen YH. From JR Aomori Station go to bus stop #3 or #9 and take the bus for Moya Hills or Villacity Moya. Get off at Moya-Kogen after about 37 minutes. The YH is 100 meters up the road. Moya Hills Ski Resort has 6 lifts and a half day pass is 2000 Yen. There are 3 lifts, Hakkoda has an average snow depth of 200-300 cms, with a vertical of 650 meters. Hakkoda is 24 kms from Aomori Station via the Hakkoda-Towada Gold Line. Accommodation: In Morioka there is a capsule hotel directly opposite the train station. There is also a relaxation cafe, Z~ , along the main street on the left side, 2F, about a kilometer from the station. Appi Kogen has a vert of 828 meters, 18 lifts and an average snow depth from 100-200cms. You can get there from Morioka on the Hanawa train, taking 1 hour. There is a free shuttle bus from Appi Kogen station(West Exit, bus terminal 26). Appi Kogen Live Camera Link. Accommodation at Appi-kogen Kamui-no-mori Youth Hostel. There is a free Shuttle bus between Panorama and Shimokura areas. Panorama has a vert of 460 meters and Shimokura has a vert of 550 meters. Getou Kogen is west of Kitakami with 5 lifts and a vert of 430 meters. They share lift passes with Appi Kogen. From Kitakami there is a shuttle bus which leaves from bus bay 3 just outside of Kitakami station (~Y400 each way) and takes about 40 mins. 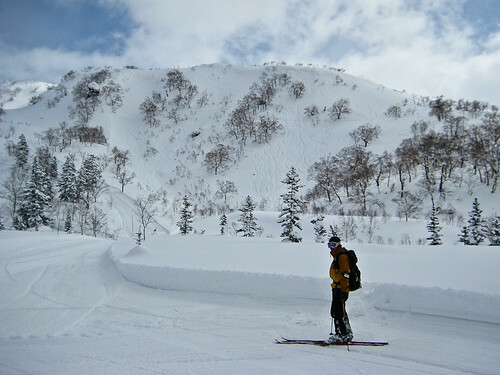 Tazawako has 6 lifts and an average snow depth of 180-200cms. 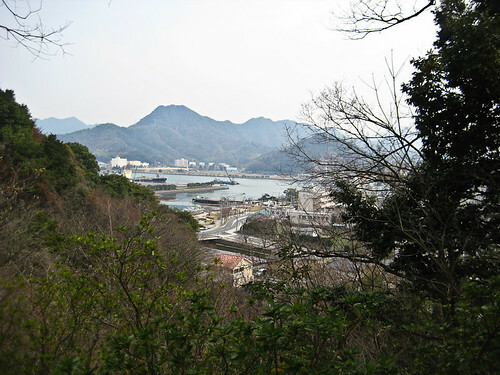 The train goes to Tazawako Station and the resort is about 25 minutes away. There is a Youth Hostel down by the lake(From JR Tazawako station, take a bus for Tazakawako for 15 minutes, and get off at Tazawako-Koen-iriguchi). Tazawako is west of Morioka. Nothing much needs to be said about Niseko. It is very well known. It receives massive dumps of snow but can get quite crowded. 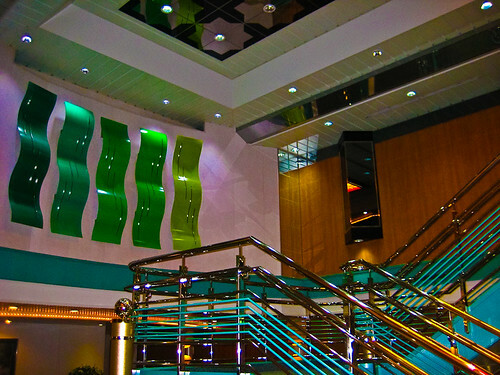 There are four main inter-connected resorts and there is accommodation to suit every budget. Get here from Sapporo airport via a shuttle bus, or train from Tokyo. The Shinkansen bullet train goes all the way to Hakodate as of February 2011, but there are plans to extend the line in the future. Go for day trips to Rusutsu if you like. Smaller and gets less snow than Niseko. There are two sides to the resort – Furano Zone and Kitanomine. The trees are very tight here and you have to dodge the ski patrol to go off-piste. There are lots of places to stay for varying budgets. 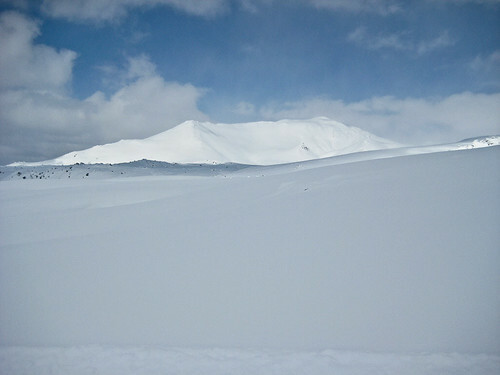 You can do day trips to Kamui Ski Links, Tommamu and Asahidake. 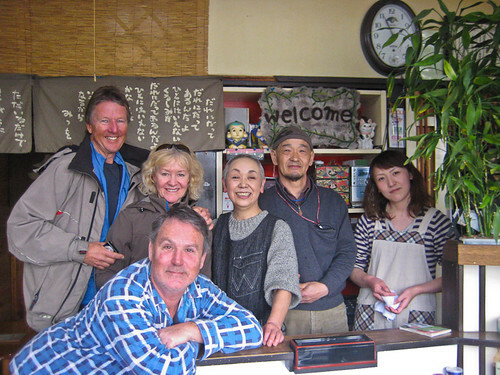 Accommodation: The Otarunai Backpackers Hostel Morinoki. Dormy Inn Premium, across the road from Otaru station. Otaru Green Hotel ~3500 Yen. 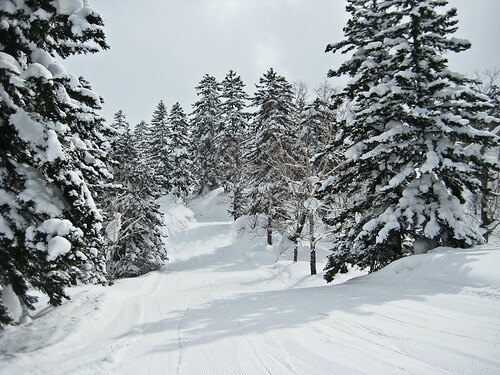 Kiroro Ski Resort is 40 kilometers west of Sapporo and 30 minutes from Otaru JR Station. The average maximum snow depth is about 400 cms. There are 4 Quad Chairs, 4 double chairs and a Gondola. The highest point is 1180 meters and there is 610 meters of vertical to ski. There are two hotels at the resort. Tenguyama has an average snow depth of 150-170cms and has four lifts. To get there, take the number nine bus from Otaru station and get off at the last stop. There is the Otaru Villa Mountengu Youth Hostel which has beds for around 3500Yen. It is 2kms north of Otaru. 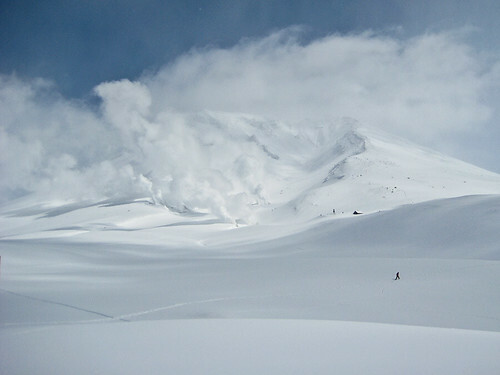 Asarigawa has an average snow depth between 150-200cms. There are 6 lifts and it is 30 minutes by train from Sapporo. 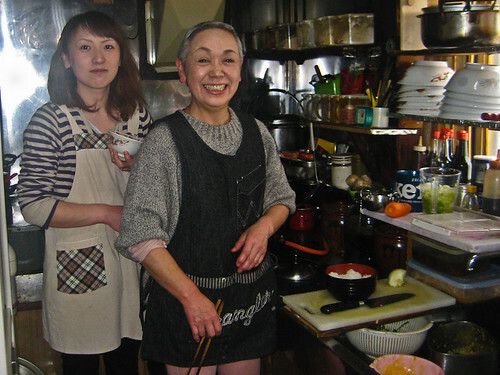 Accommodation – Ino’s Place ~3000Yen. Marks Inn Sapporo ~2100Yen. DK Guest House Sapporo (long-term rates). Jimmyz Backbackers. Teine has about 14 lifts and around 450 meters of vertical. 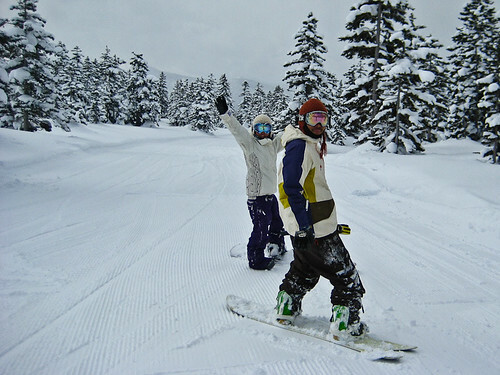 Average snow depth is 200 – 250 cms. It is made up of two areas, Highland and Olympia. To get there take JR train from Sapporo to Teine, then catch the bus. It takes about 45 minutes from Sapporo Station. JR sells a package includes fare and lift pass. Kokusai is a fairly small ski resort and you can get there via a subway to Makomanai station and a bus to the bottom of the ski hill. Some ticket specials include a lift pass. There are 5 lifts and average snow depth is 300-400 cms. There is a 5 day pass from Japan Rail (JR) which is very good value. It is called the Seishun Juahachi Kippu. It is for 5 non-consecutive days travel on local JR trains. It costs 11,500 Yen. The Spring ticket is on sale from February 20 to March 31 and is valid for travel between March 1 to April 10. A day is from midnight to midnight.